I’ve always been fascinated by the missed great race performances due to an athlete’s mental breakdown rather than physical issues. Don’t get me wrong, plenty of bad races can be attributed to acute physical problems like injury, nutritional issues, or muscle fatigue. In my fifteen years of experience with elite-level athletics, I’ve always taken great interest in the psychological side of training and racing. 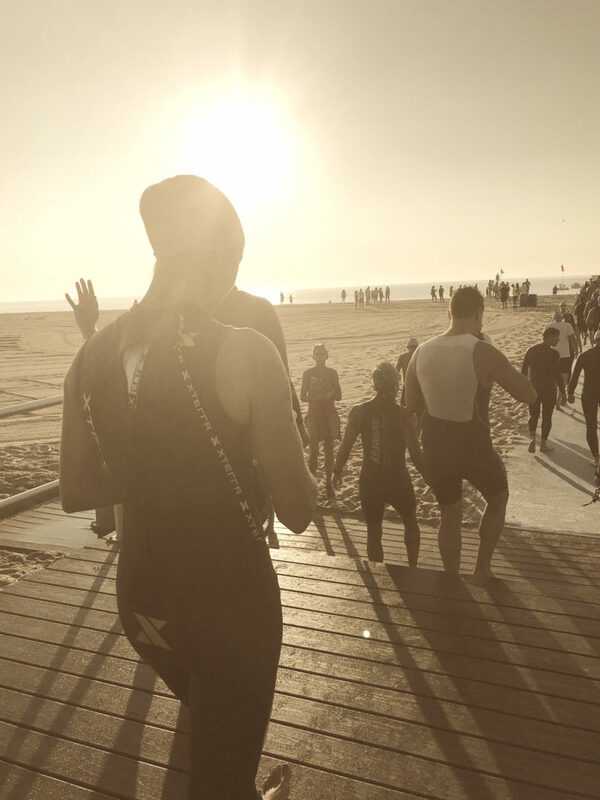 I’ve spent time around some of the best triathletes in the world. While their physical abilities are always superb, I’ve found that it’s their mental strength that sets them apart. On the flip side, I’ve known a lot of great athletes who didn’t reach their potential either in some races, or throughout their entire careers, because their minds have held them back. Throughout my professional racing career, I too experienced being held back by my own psyche. I also experienced some of my best performances when my mental preparation matched my physical preparation. Endurance sports are hard on both the mind and the body. As athletes, it’s important to place as much importance on our mental preparation as we do our physical training. Toeing the start line mentally ready to go can make the difference between the race of your life and a DNF. Here I want to share with you a handful of tools I learned to use to prepare my mind for race day. 1) Visualization – This is probably the most powerful tool in the mental preparation box. The key to this technique is to start your visualization practice months before your key race. Think through your race day. You can even think through the days leading up to the race as well. Go through the entire race day, from when your morning alarm rings until after the finish. You can even include how you’re going to celebrate a great race. Think through every moment in between. Think about what an amazing experience it is going to be, think about how you will thrive in the race. Think about how you will feel at each moment, your emotions, but always in a positive light. Think about how calm and collected you will be through the whole day. How will you execute every aspect of the day? Address how you will embrace the pain and the tough moments. Dictate all of your thoughts throughout the day. Again, you need to make sure you maintain a positive take on every moment. After you’ve envisioned all of these thoughts and moments, make sure to write it down in a journal. Then as you approach your race, spend a little time every day thinking through your scenario. Every time you think through or review your visualization, you are creating your own reality. Those positive thoughts and emotions are being programmed into your brain and you’re actually deciding now how you will feel. This will become ingrained in you psyche and creates your future. 2) Confirmation – As race day approaches, athletes may start to doubt themselves and their preparations. When this happens, you can start to talk yourself down and not trust in your preparation. Negative perspectives like this do you no good. You need to focus on the training you DID do, rather than the training you DIDN’T do. You need to confirm that you are indeed prepared to race. An easy way to do this is to spend time reviewing your past training plans/logs to reinforce and remember all of the hard work and sweat equity you put in to be ready for this race. I once heard a world-class triathlon coach say that endurance athletes have about a three day memory. They can’t seem to remember the months and years of good training they’ve done. If they haven’t felt a certain way or done certain workouts for a few days, they start to doubt themselves. We tend to remember only the few bad workouts or that maybe we missed one key workout. I can remember being stressed about a race because I was sick for a week and missed 7 days of training. I didn’t think about the seven months of great training leading up to that one week in bed. If you take the time to read through your training logs, it can help reinforce how much work you’ve done to prepare for your race. Use this tool to confirm to yourself that you’re ready. As you read back through all of your logs, you will realize how far you’ve come as an athlete. You want to stand on that start line confident in your fitness and this will help remind you of all of the miles you put in to get to where you are. 3) Affirmation – We are our own worst critics and we tend to talk negative to ourselves. This is especially true when we are experiencing doubt about an upcoming race. Motivational speaker Les Brown says that there is an old African proverb “if there is no enemy within, the enemy outside can do you no harm.” By affirming your strengths to yourself, you can eliminate that enemy within. Of all of the mental preparation tools, I feel that self affirmations are the one that some people struggle to do. It can feel awkward or maybe corny to tell yourself positive things. You need to get over any feelings like this and begin to tell yourself how good you are. Like visualizations, your thoughts will begin to create your own reality. A great way to do this is to start writing down positive thoughts, phrases, or sentences on flash cards. Think about your future state. How do you want to feel? Then each day, in a quiet and peaceful moment, read through your flash cards. Ideally you read them out loud so you can hear yourself say those positive things to yourself. At first, you may feel like you’re telling yourself fibs, but the more you practice, the more you will internalize these statements and believe in them. This will become who you are. For example, you could write down something like “when I run, I am relaxed and my legs feel light and springy, like a deer galloping through a field.” It may feel hokey or strange to recite that to yourself, but that will become your reality. You will to eventually feel more relaxed and springy as you run. 4) Worrying Time – One of the best tools I’ve come across to avoid excessive pre-race nerves is to schedule worrying time. As race day approaches, anxiety around all of the ‘what ifs’ can build in your brain. Some nerves are inevitable. In fact, a certain limited amount of the butterflies in your stomach is healthy and can help your performance. This is because it helps release your stress hormones designed to increase our physical abilities as a natural defense mechanism to stress or danger. However, too many of these nerves, for too long (days and weeks) before a race can leave you mentally exhausted and physically hamper your performance. A sports psychologist I worked with gave me this great technique to deal with those nerves in the days before a race. He recommended scheduling time to worry about those ‘what-ifs.’ Start by setting aside 30 minutes at a certain time on a certain day. If you feel anxiety before then, tell yourself “it’s not time to worry right now, I will think about this today at 3:00pm (or whenever you decide).” Then during your time slot, worry as much as you want about what could go wrong. Go crazy with it. Then think through how you will handle all of those scenarios. Use that time as contingency planning. When the time is up, then you tell yourself that you’re done with the worrying and it’s time to move on. You can schedule more time later or the next day. If you feel those jitters creeping in again, tell yourself you can’t worry now, but you can during your next worrying session You have the ability to tell yourself that you can’t worry about what could possibly happen all of the time. I found this to work really well for myself. Give it a try, you may find it really helps to mitigate your pre-race anxiety. 5) Failing to Plan is Planning to Fail – If you think about everything that goes into your race itself, there are a lot of moving parts that make it a fairly complex endeavor. The more you can plan out and address the details that go into every aspect of the race, the better. Spend the necessary time to think through all of the steps and details surrounding travel to the race, going through all of the motions of the final days leading into the race, executing every step of the race, and contingency planning for potential issues that could arise. For instance, think about your race nutrition. Spend the time well ahead of race week to think through how much XRCEL you need to bring to the race, where you will pack it in your luggage, which water bottles it will go in for the race, how much and how often will you drink it, will you have spare XRCEL if you drop a bottle, etc. Spending the time to think through these kinds of details ahead of time can save you a lot of stress in that final week before the race. This shouldn’t be limited to your nutrition planning, but you can do this for all aspects of your race; from travel logistics to your equipment. With forty full-Ironmans to my name and even more half-Ironmans, I’ve heard of, seen, or personally experienced almost everything that could go wrong. The better prepared you are going into the race, the better you will be able to handle any issues that Murphy’s Law will throw at you! 6) Victory Lap – I once spoke with a sports psychologist before a race. He said one sentence to me that has stuck in my head ever since. In fact, I stole it and say it to many of my friends and athletes before they race. It’s a very simple but a profound idea. He said, “Tomorrow’s race is your victory lap. Go take you victory lap.” We often think of the races as the end point of our journey. That viewpoint tends to place too much gravity on the results of that race. It can make it appear as an all or nothing event. Instead, try to look at the race as your reward for all of your hard work and preparation over the previous months. Getting to the start line healthy and rested is the hardest part about any endurance sport. Look at the race as your celebration for all of your sacrifices and everything you overcame in your training. You get to go race because you did everything you could to get yourself to that start line. The time you spend actually on the race course is a small fraction of the time you spent training. Enjoy every minute out there. This is your time. This really is your victory lap. Endurance sports are hard enough, don’t let your mind make them any tougher. Place the importance on training your mind as it deserves. It doesn’t matter if you’re physically fit and strong, if you’re mentally weak you may crumble as soon as the race gets hard. Just like every other aspect of your physical training, mental training takes effort and practice. Make it a priority and you may find it opens up your potential for your best performances yet.